Miyabi Chaya is a ohagi cafe in Okinawa city. 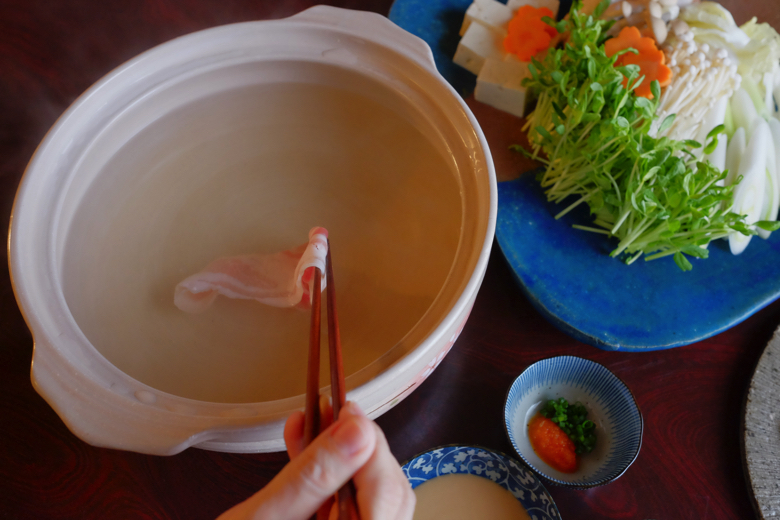 They provide shabu shabu dinner for one group only upon reservation. JPY4500 per person. Starter. Hiya Mugi pasta, like angel hair pasta, with sesami sauce (left). 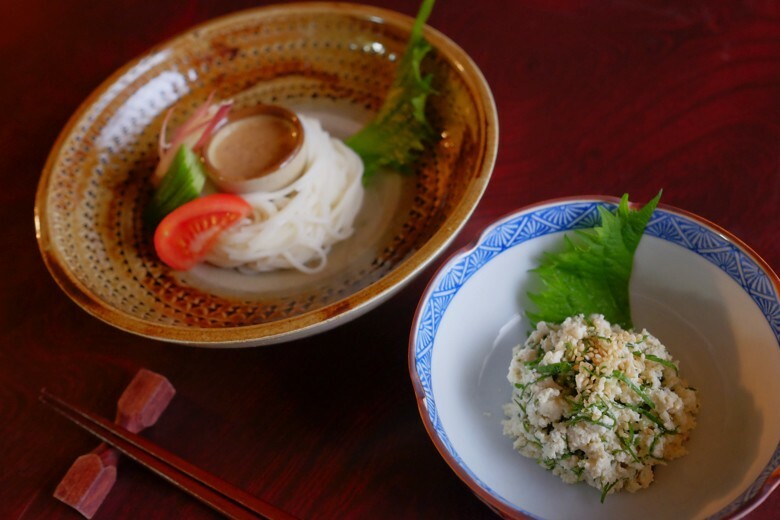 Tofu paste with Nigana plant (right). Nigana plant means bitter leaf in Japanese. This plant has been considered a medicine in the local traditional tradition. 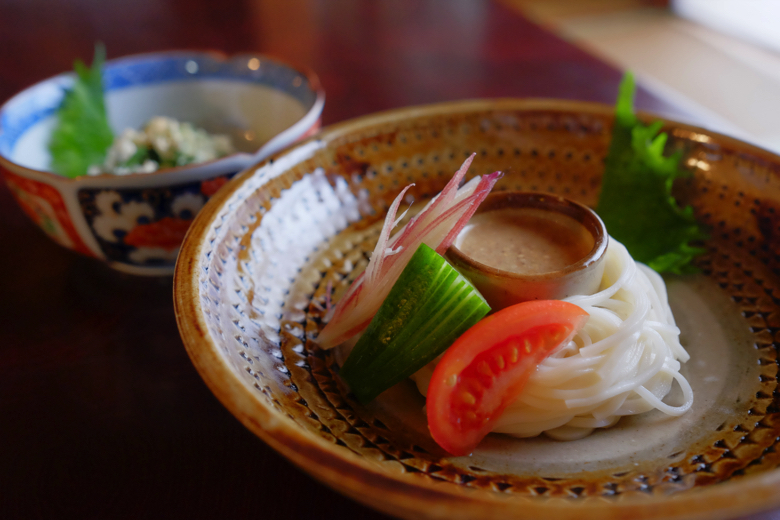 Hiya Mugi with ginger bud, cucumber, tomato and Shiso (Japanese basil). The second plate with Agoo meatloaf with some seasonal vegetables. There are lots of restaurants that serve Agoo in this island. But most of them are halfs or quarters. Agoo is a brand pork of Okinawa, it’s a black pig, like Italian iberian pork, and it’s an unique species to this island. 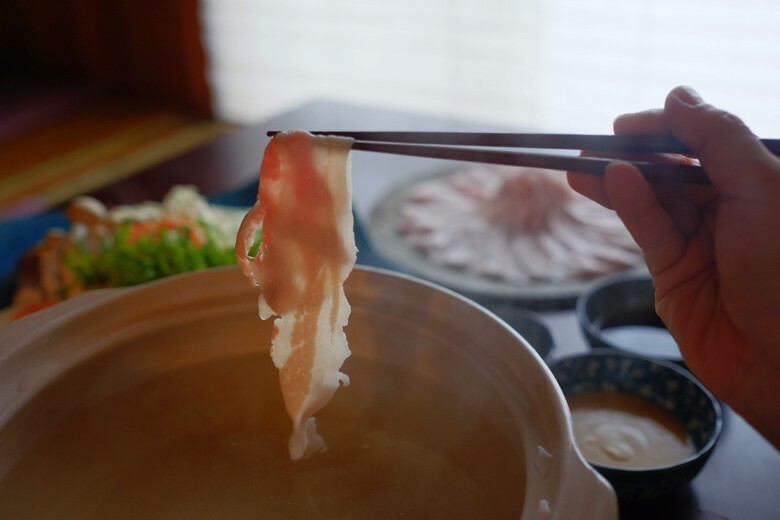 It’s a fatty meat, but rich in unsaturated fats and low in cholesterol, sweet to the taste. But it’s hard and not cost-efficient to raise this pig. This pig is very sensitive to stress, and the body doesn’t grow big. So many farmers breed with white big yorkshire pig. And they can call Agoo the quarters. But this one is a 100% Agoo. Only possible by the direct supply from one of the few farmers who raise 100% Agoo against all odds. 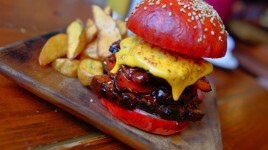 This sweet juicy hamburger steak is beautiful. Watch out for the green garnish. It looks like Wasabi, but it’s Yuzu Kosho. It’s hot. It’s a mixture of Yuzu (Japanese citrus) zest, red peppers, and salt. And here comes shabu shabu. Beautiful Agoo pork slices. Half chop and half belly. Wonderful fine marbling. Thinly sliced and ready to swim. It comes with 2 kinds of dipping sauce and some vegetables. They will have the hot pot going on your table. 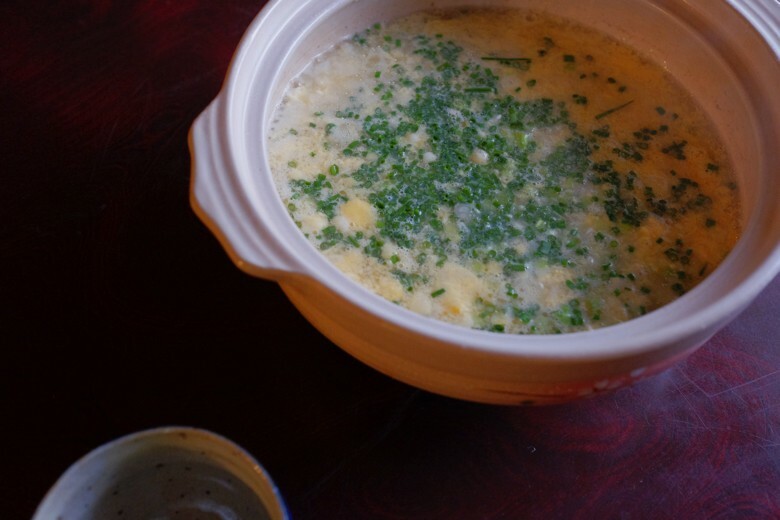 The sauce is kombu broth, lightly seasoned. My recommend is to start with some pork meats first. By doing this, you are seasoning the base with the pork too. Then throw in vegetables. Continue cooking vegetables as you enjoy the rest of the pork. After all that, they will cook rice in what’s left of the base. This way, you will enjoy all the drips of the ingredients, and enjoy every steps of the way. 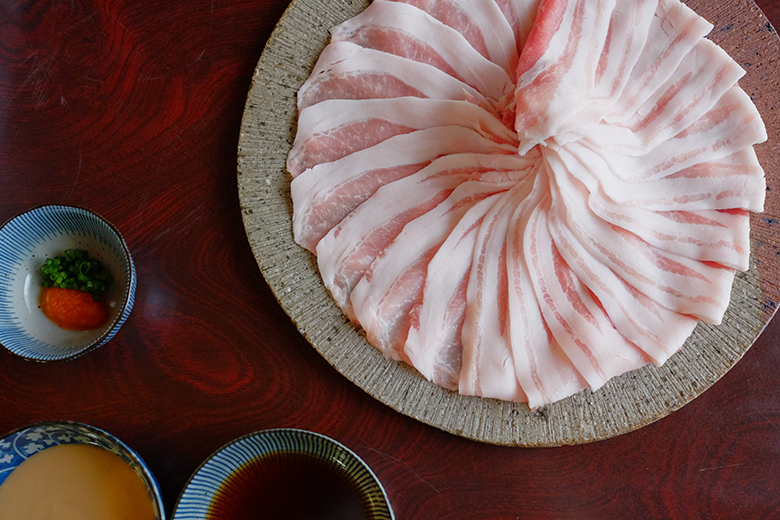 Shabu Shabu is a sound word. 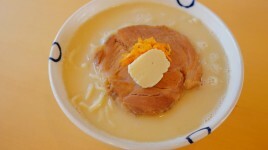 It’s the sound when you dip the meat slice into the base soup and let it swim. The important thing is not to overcook. The soup is kept maybe at 80 degrees or higher. The pork needs to be cooked at 62C degrees (by USDA). And the slice is only 1mm thin. You only need to let it swim for 5-6 seconds. DO NOT drown it in the soup. When you see a drowning slice, go rescue it right away no matter who it belongs to. Throw in some vegetables after you enjoy some pork. Temperature drops down when you throw them in, and you should wait until it comes back boiling. 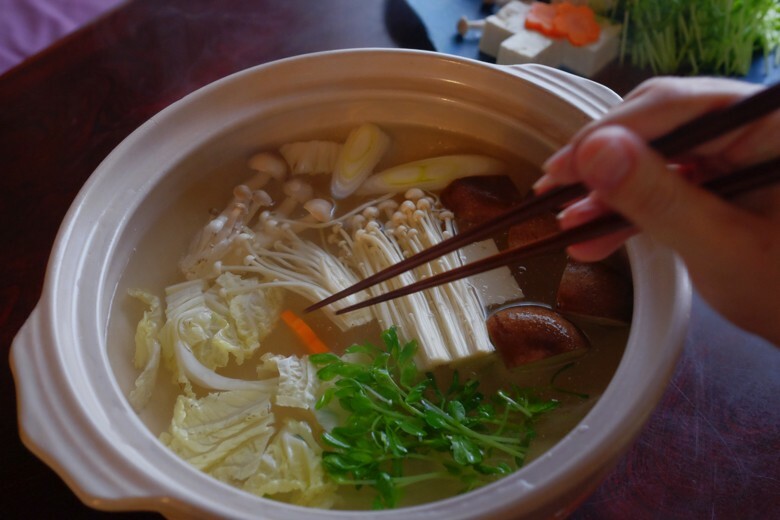 When it does, the vegetables will be ready and the base soup will be high enough to shabu shabu pork again. You have 2 kinds of dipping sauce. One is rich creamy sesami sauce. One is Pon-zu, citrus vinegar soy sauce. 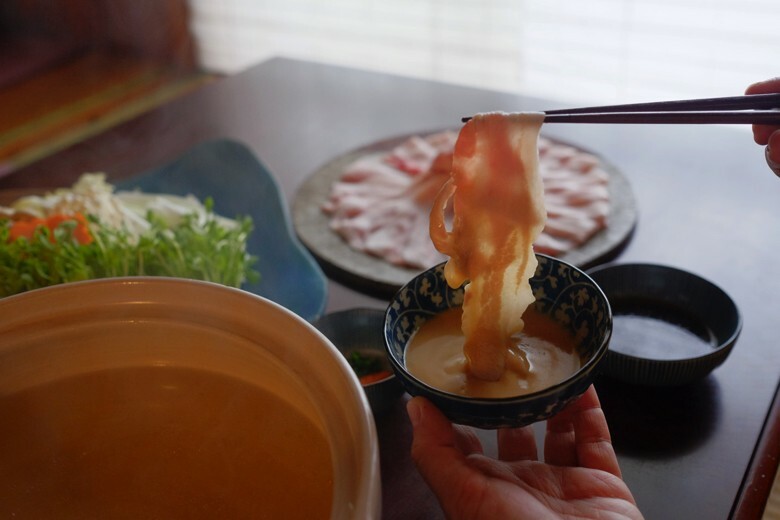 It’s pretty typical with Shabu Shabu. 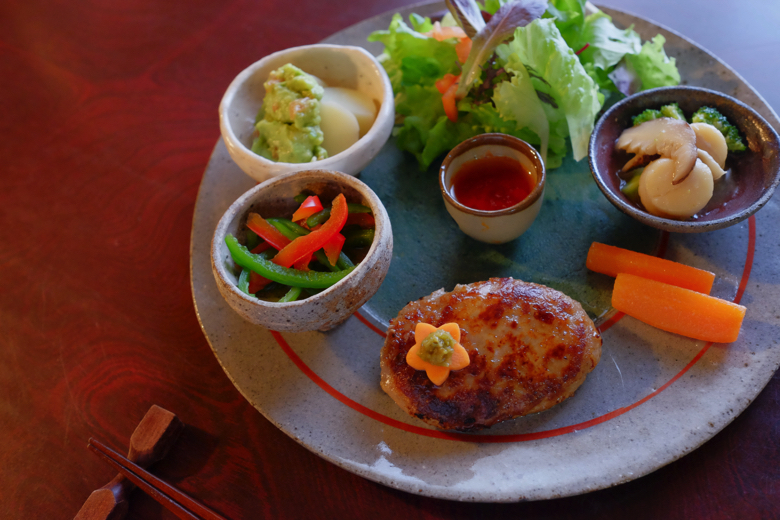 Some people like to have vegetables with Pon-zu and meat with sesami sauce. I like to start with Pon-zu, because it’s lighter taste, then later switch to sesami sauce which is much richer. 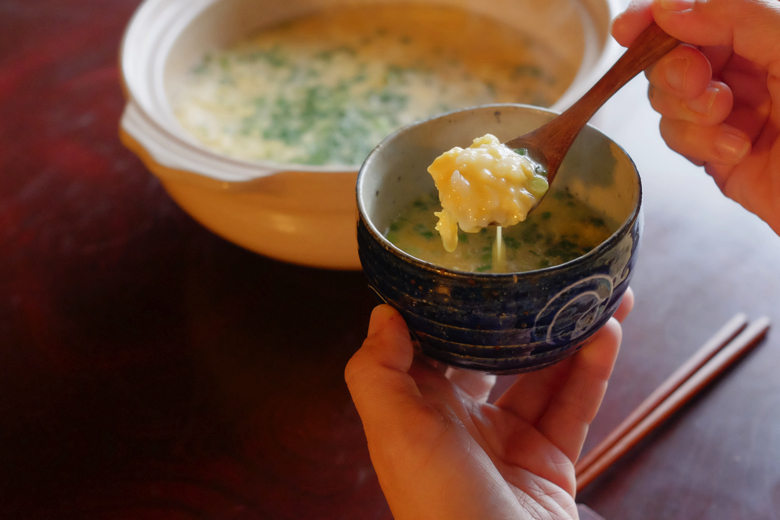 When you finish all the vegetables and pork, what you have left in the pot is the beautiful precious soup. They will cook rice in it for you and this is the highlight of your meal if you are a rice man. 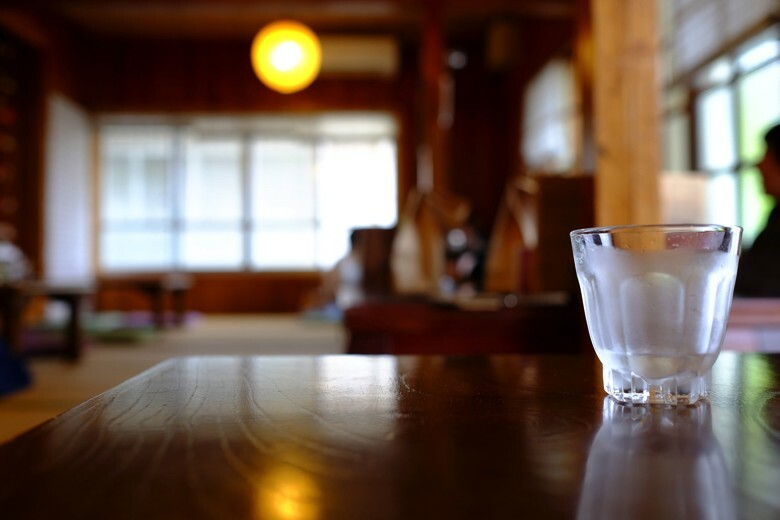 You think you are full already by now, but you can sip this in easily. It looks simple. Just rice and eggs, with some scallions. But it’s a Umami bomb. 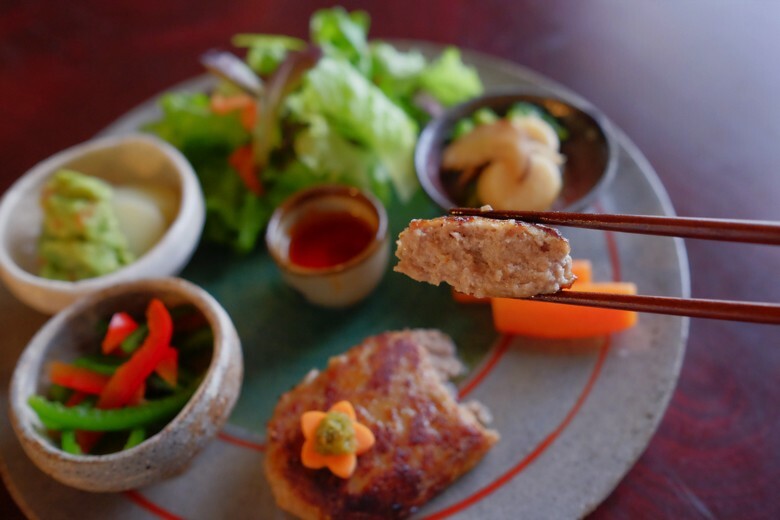 Seasoned with all the pork and vegetables, topped on the kombu base, the Umami is all united in each grains of rice. And of course, the dinner will be finished with Ohagi. I know you are far beyond full at this moment and you want to take it home. You can, of course, but I really recommend to have one then and there. It will still be good the next day. But the texture will be different. So I would like to push you one more time. 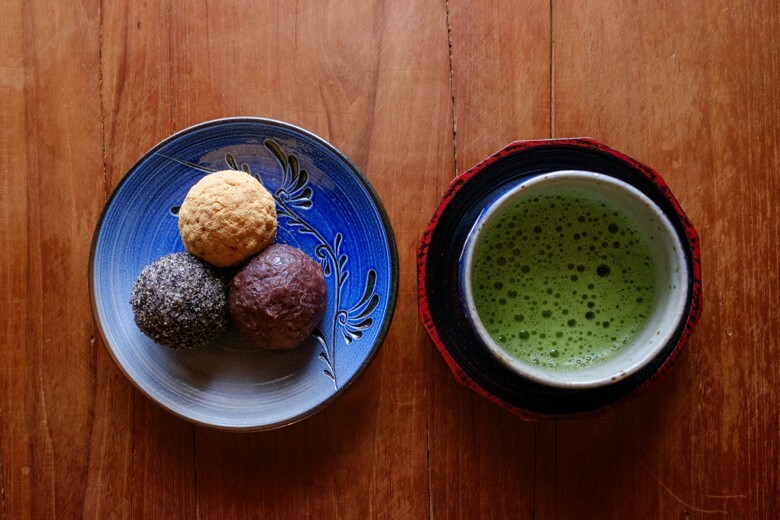 This Ohagi, when fresh off the hands of the chef, feels like a good sushi. The rice falls apart on your tongue and the sweet bean paste will fill out your mouth with mellow sensation. Let me know if you want to make a booking. The cafe owners are good friends of mine and I will help you book for them. You can bring your own drinks. You will have all the place reserved for your group. Great for private parties and family gatherings. how do i contact them? they dont seem open for dinners. I have an email from my friend who just visited this cafe for private dinner. I would like to thank you for arranging our dinner at Cafe Miyabi Chaya last week, it is by far the most memorable dinner that me and my wife had ever experienced. The dishes that Jimmie-san and Masami-san prepared are so well thought of at all levels, the use of local seasonings spices, balance of the tastes, pick of fresh ingredients, gorgeous plating, and of course the highlight of the night, the real traditionally raised Agoo Pork, tastes amazing using ShabuShabu style. I think any other way of cooking could damage the true taste of the pork. We enjoy each and every course, and we’ve finished every bit of goodness that was served to us. Yes, all six courses from the delicious Tofu starter all the way to the red beam paste sweets, lick all dishes clean. I have to say this dinner is not just about good food, but I really appreciate the warm hospitality from Jimmie-san and Masami-san. They are so so kind and welcoming, just like welcoming us into their home, and despite our very limited Japanese, we have managed to communicate and understand each other and we had great laughs. 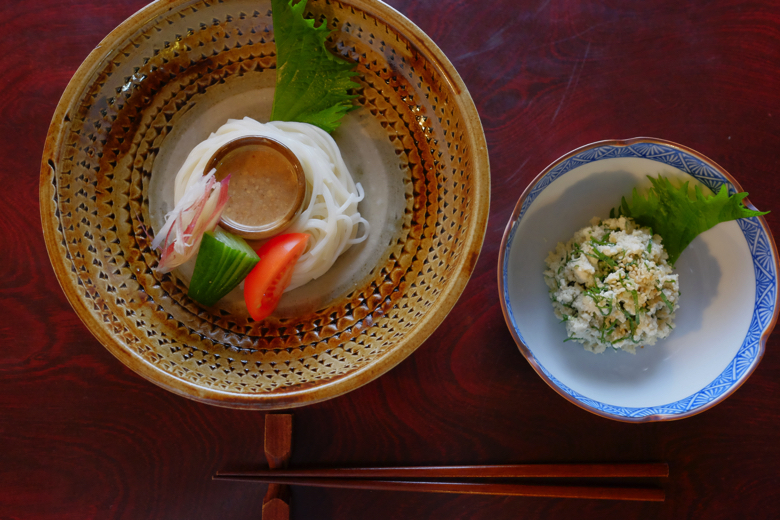 The surrounding environment are so peaceful and comfortable, and sitting on traditional tatami while dinning is something we wish to experience but never had a chance until now. You can feel the history of the house by its old wooden pillars and drawer set, which we seldom cherish in the city of Hong Kong nowadays. 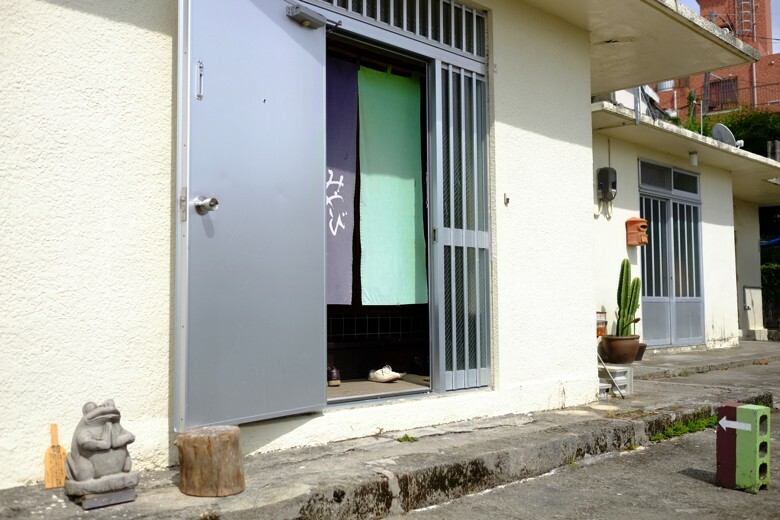 We’ll be back to Okinawa soon, it’s our favorite place to visit and to get out of the city. We are a family of 4 coming to Okinawa for holiday next week. Can you help us book Miyabi Chaya for 19 Dec (Wed) 11am? 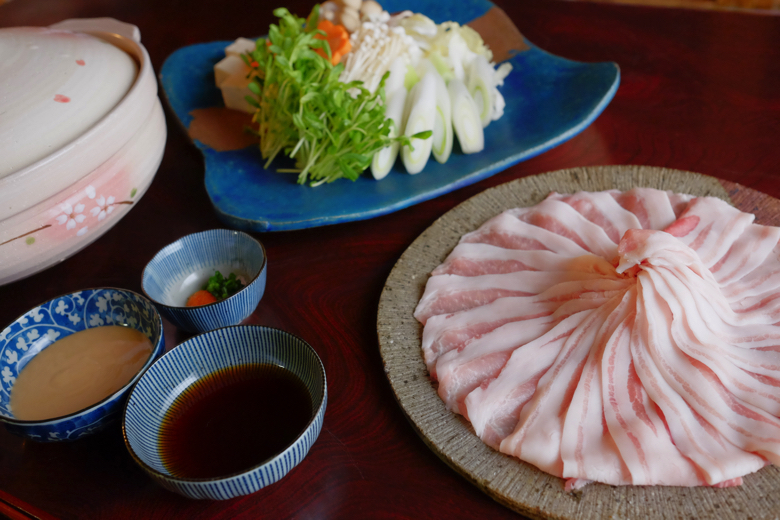 We are really interested to try the Agoo Pork Shabu Shabu. Thank you very much for your comment. It would be a great pleasure to book the dinner for you. 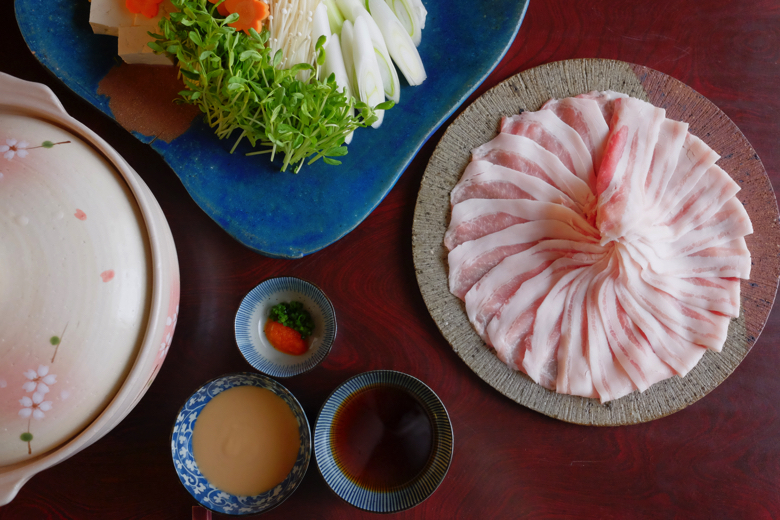 Shabu Shabu is only available for dinner from 19:00 for one group only each night. 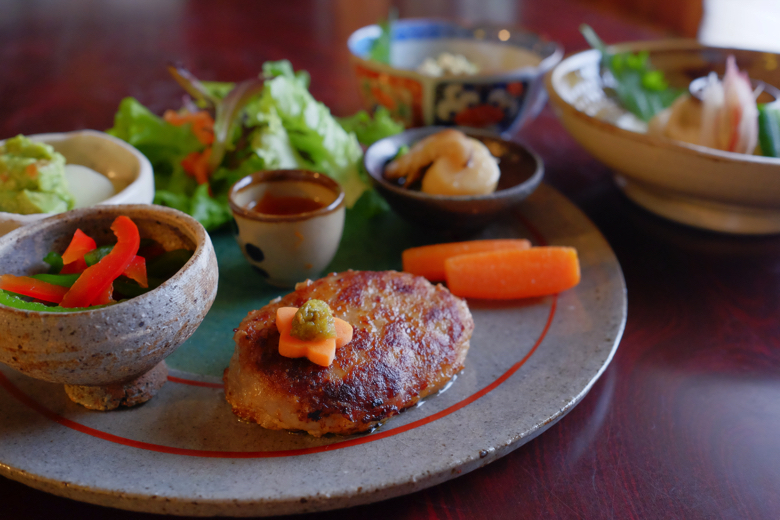 During the day, they serve Ohagi sweets and lunch. You don’t need reservation for lunch. I sent you an email to discuss further. We will change to dinner on 19 Dec. Please help us make the booking. That’s funny. I double-checked and I did send to your email address. Maybe it’s in your junkmail. I can’t make reservations without personal contact. I checked with them. Dec 19 is not available. But Dec 20, 21 and 22 is open for dinner reservation.